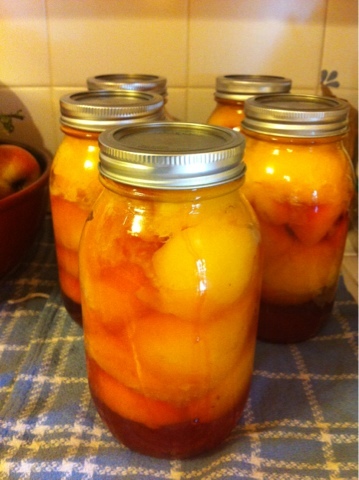 Yesterday, Babydoll and Cowgirl canned peaches and nectarines. It was my first time canning whole fruit. My previous experience was about 10 years prior after picking bags of fresh apricots from a friend's tree and making preserves for the first time. It was a blast! 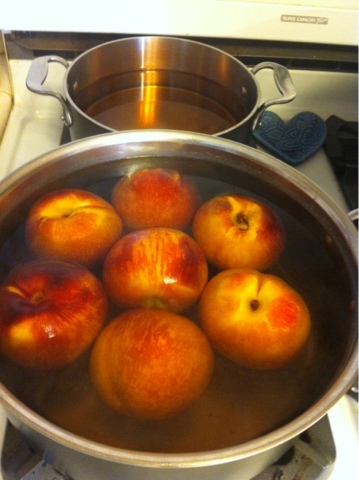 Seriously, I completely geeked out over canning. Cowgirl referred to it as 'homesteading', an expression that I loved. It was enormously satisfying and a fun way to spend an afternoon; two hours felt like only 20 minutes had passed. Canning itself isn't difficult - it's just time consuming. I learned that creating the seal is key: it's what keeps the food airtight and from spoiling. 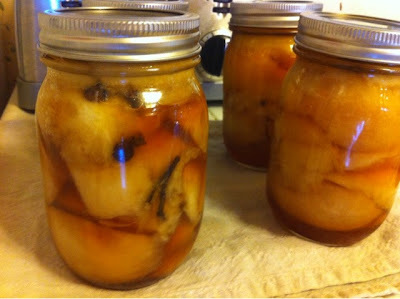 I also learned that it takes 24 hours for the jars to cool and for the seal to fully set. All our jars put up perfectly...but I'll know for next time they need to sit undisturbed after being pulled from the canner, instead of tapping each one to test for a good seal. D'oh! 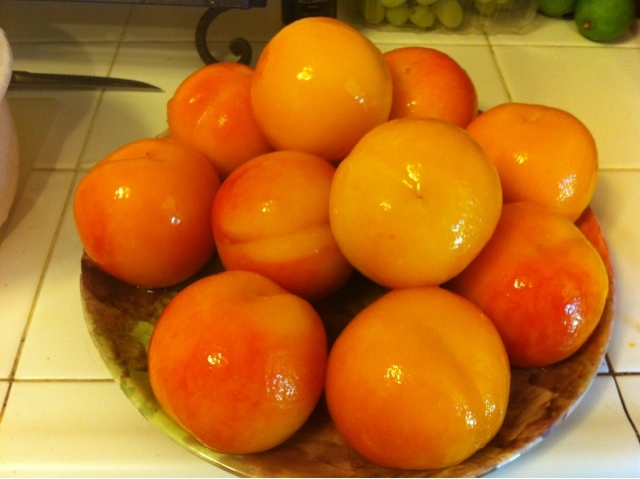 Pretty peeled peaches! The shine makes them look candied...om nom nom! and 'spiced' with whole cloves and allspice. Finished product! Canned peaches, cooling on counter top. The aesthetic alone totally makes me swoon. And to think that this was the way families preserved their foods for the winter months gives me a historical hard-on. In all seriousness, I have an enormous appreciation for how difficult meeting just the basic needs of a family were two centuries ago. It was a full-time, dawn-to-dusk endeavor. Now that my confidence is up, the sky is the limit! I'm thinking of trying a few of the more exotic recipes - like Okra Pickles, Cinnamon Watermelon Rind Pickles, a homemade ketchup or chutney...you know, since I'm completely sick of peaches. Yeah you do!! Babies trump canning, every time.